Apologies for the lack of blogging - University work got in the way for a while and I have had very little time to myself, let alone time to blog! Anyways, semester one is well and truly out the way - very scary to think I only have one semester of uni left... Roll on graduation in May! Eeeek! I took these photos a while back during the Christmas holidays. Now, it simply isn't Christmas without a spot of Velvet here and there, am I right? I've had this dress for a few years now, it was a maxi dress that I shortened and now provides me with the perfect festive party dress. I love the colour and the crushed velvet effect is a classic textile for this time of year.. even though it's now January..
Wow, how amazing is this dress? It suits you so well! This outfit is gorgeous I can't believe it was from a charity shop! I'n not usually a huge fan of velvet but this is stunning, gorgeous colour on you too. you look very pretty. I like your hair so much and the dress suits you well. Feels like a never ending story. Enjoy the last period of study anyway! Love the outfit looks really nice. Love the dress, it looks really good on you. 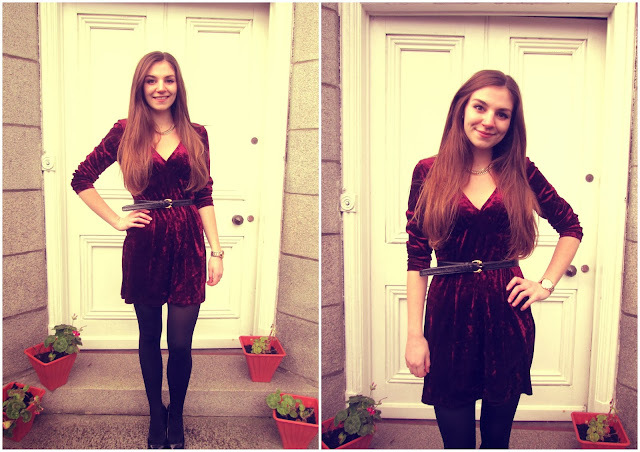 :) I LOVE velvet so much, it seems to definitely be a big thing right now! Sooo pretty!! !I like your blog , what about following each other? 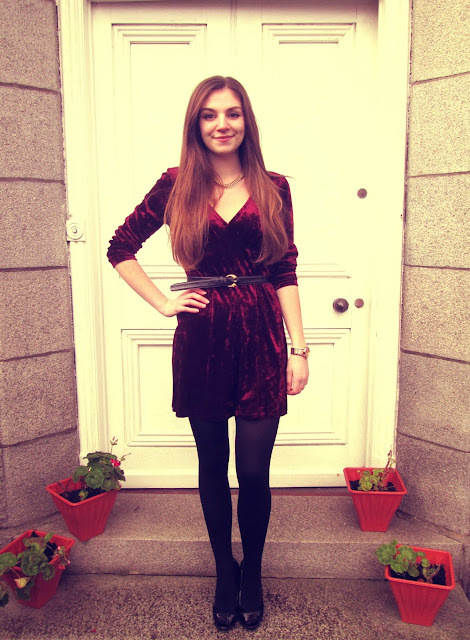 LOVE this velvet dress! You look great! Your dress is a great color! 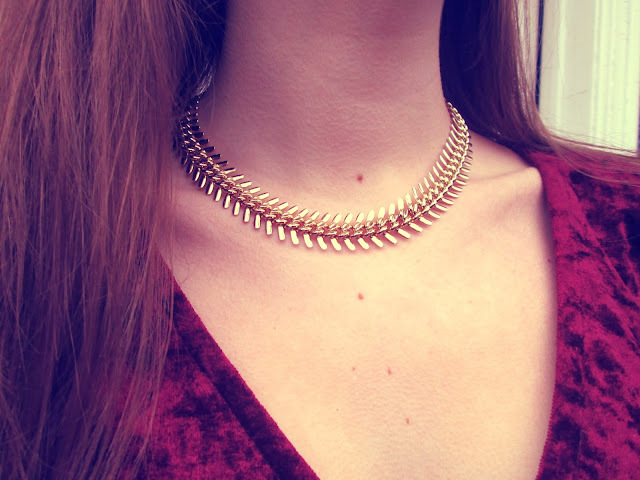 Bellla perfect!Shall we follow by instagram and facebook? I looove that colour and it looks lovely on you! 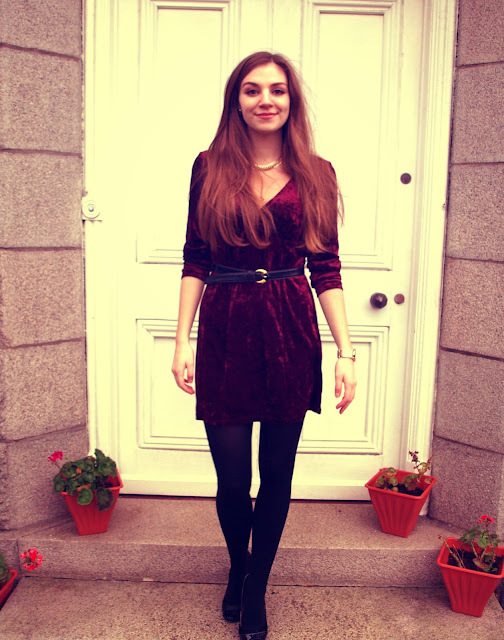 That velvet dress is gorgeous & it really suits you! I love red velvet for Christmas time, this is lovely, and creative! great dress! love this look! I love it! 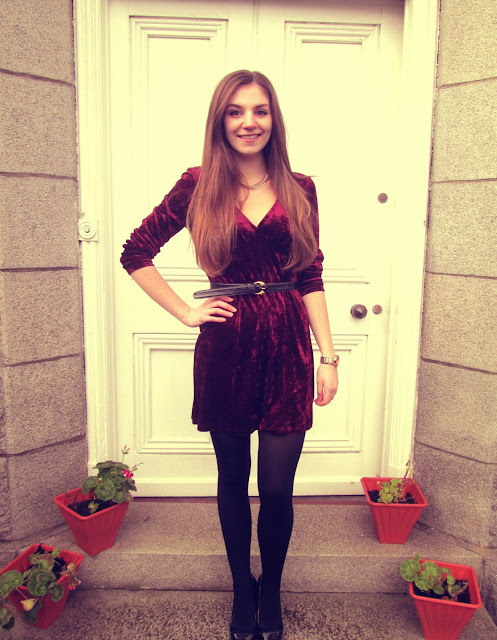 check my post about Velvet fashion returns! I graduate this year too! Good luck with your last term! This is gorgeous - I can't resist a little crushed velvet at Christmas! ooo graduation is so close!! what an exciting time for you- enjoy the rest of school while you can :D And stop it with this dress, it's AMAZING. i want it. The necklace is absolutely gorgeous! Such intricate design. its such a pretty color, n I love ur neckpice ! I like ur necklace it fits very well with the dress. You've done it again!!! Ahh gorgeous outfit… And how you found it from a charity shop… Skills!!! Such a lovely dress and find! This dress is lovely on you, love the necklace!!! 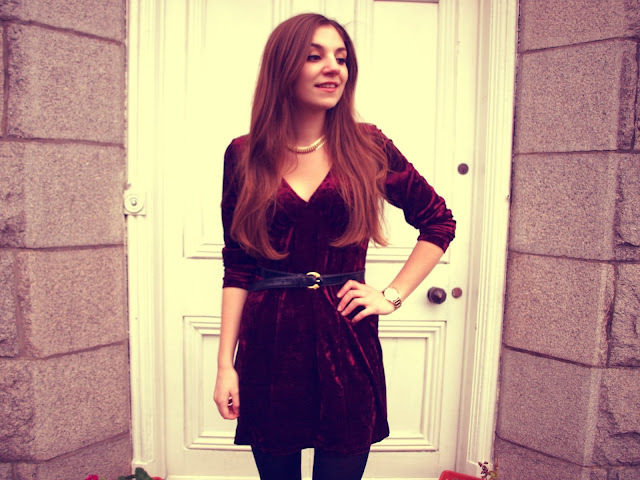 Beautiful dress - I think velvet at Christmas is a definite must! Good luck with your final semester at Uni, but most of all, enjoy it! Hi, thank you very much for visiting my blog! I really appreciate that! This is such a pretty dress. The colour is gorgeous! I love velvet dresses. Wow you are super super gorgeous! Love this look. Glad to have found your blog through Ashley Sue and becone a new follower! You pull this off perfectly. 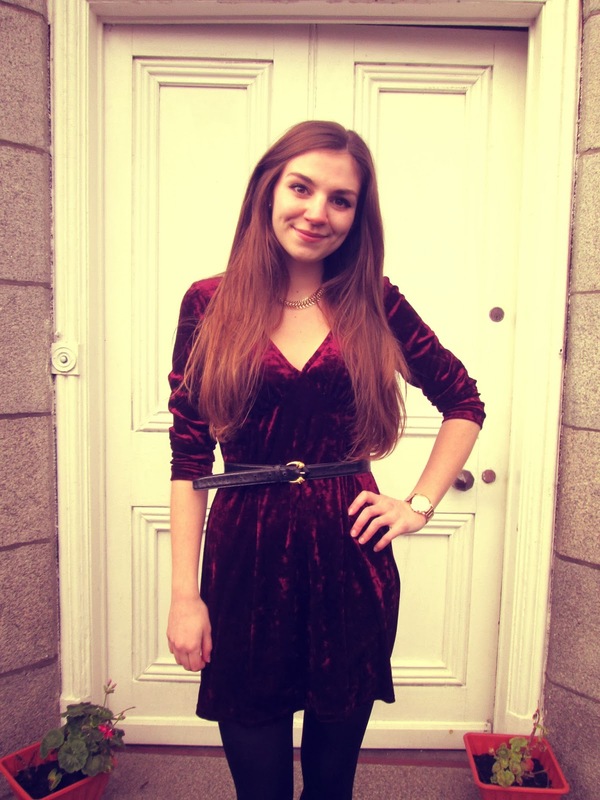 Looove a gorgeous velvet piece! I love the texture of the dress. It is so Christmas-y! That is such a gorgeous velvet dress! I have been on the hunt for one for a while. Congratulations on finishing another semester of uni! It can be so draining. That's so exciting that you're graduating soon! I like that dress, it's the perfect color, it's so weird how Christmas is now 11 months away. But by the time we know it 2014 will be over haha. Thank you for following, and I followed you back, you have a very nice blog! just to rhyme with your title post, i'd say velvet is lush!!! hahah! Such a cute dress! You don't see too many simple velvet dresses like that - great outfit!! It will be my pleasure to follow you back and to read and watch your posts. The vintage velvet dress is so pretty I find this is the right color for velvet, I think. The dress is very nice, it's a lovely colour! Absolutely loving the outfit :) and the necklace! Oh my, the excitement of having only one semester left! Good luck on all things uni! I love the necklace!! Such a sweet look! You look hella cute! Cute dress! Love that velvet has made a comeback. You look great! I love the color of your dress and your necklace! That is a cute dress on you! If you like connect with From Head to Heels on Facebook - www.facebook.com/fromheadtoheels for daily talks and shares :-) and expect more posts soon so do connect through to bloglovin' and GFC. And if you have a moment as well do connect through to From Head to Heels via Twitter, Instagram, Keek, Pinterest and Vine with the handle @fromheadtoheels for more shenanigans. Thank you for the follow on bloglovin or I wouldn't have found your amazing blog!!! I love your dress and you are so gorgeous! I love the dress! And your style in general! Thanks for being my very first follower on bloglovin'! ah, i absolutley love this dress! Such an amazing charity shop find, I wish I had your eye in charity shops! I've only just came across your blog, and I'm happy I did! I have wanted to buy a red velvet dress for the longest time! You look great in yours! I wish I could pull off velvet this well. That's a really pretty necklace too. This dress is so gorgeous on you Helen! You can totally rock it wearing velvet!! image is on the notes. I offer 150 to 200 euros.